Here’s the other Avi book I read over sping break. I just adore him and freely admit he has had a very strong influence on my writing. Once a Newbery winner and twice a Newbery honor winner, his works include some of my favorite titles ever. Though I’ve liked some better than others, I’ve yet to be disappointed by any. I have to confess, this one is different, and at first I wasn’t sure I would like it. (It does actually have words though.) It starts out with the same rich, powerful sense of setting that Avi is known for, but this one is a very dismal setting. Granted, the Middle Ages were a very dismal time. Avi goes to great lengths to describe the stinking, filth-strewn city and the horrid, depraved old man named Thorston. Nearing death, Thorston brews a potion that will renew his life. However, it will steal the life of his young servant girl, Sybil. I was hooked. And I wasn’t disappointed. I loved watching Sybil’s growth. Weak, frightened, and helpless, at first she and a talking raven named Odo believe Thorston is making gold. And so does the rest of the town. Despite the threat of a crooked magistrate who wants the gold for himself, Sybil begins to use her wit and intelligence to find the gold and survive when she fears Thorston has died. It is Sybil’s transformation drives the story. I absolutely love this one! And The Book Without Words is less than 5 bucks on Amazon. 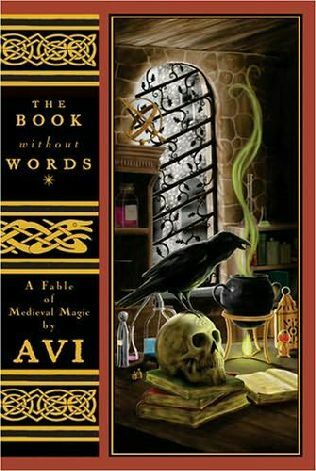 What a unique book for Avi. I have only read the City of Orphans and was captivated by that book. This sounds very dark, but intriguing. It is dark by nature, but not as disturbing as parts of Harry Potter. It’s very tastefully done and absolutely beautifully written. Oh, I adore Avi. This one actually reminds me of Neil Gaman’s Newbery-winning “The Graveyard Book”. Their styles are different (though both authors are amazing), but both explore this theme of death and encourage readers to LIVE WELL. I think I would like this one too. 🙂 I liked The Graveyard Book also. Avi’s work is always artistry on paper. I’ve got to read City of Orphans. I keep hearing that one.